The Chicxulub Impact Structure is a leading candidate for the cause of the extinction at the Cretaceous/Paleogene (K/Pg) boundary. This structure is located on the northwestern corner of the Yucatan Peninsula in the state of Yucatan in Mexico. The crater is filled and buried by Tertiary carbonates so that surface evidence of the 180 km diameter, 3 km deep crater which resulted from the impact is very sparse. Images of gravity and topographic data that I collected and/or compiled show the size and form of the buried crater. Having the history of researching Chicxulub allowed me to recognize impact caused tsunami “ripples” in northern Louisiana 3D seismic data. Justiss Oil granted me access to a core across the K/Pg. 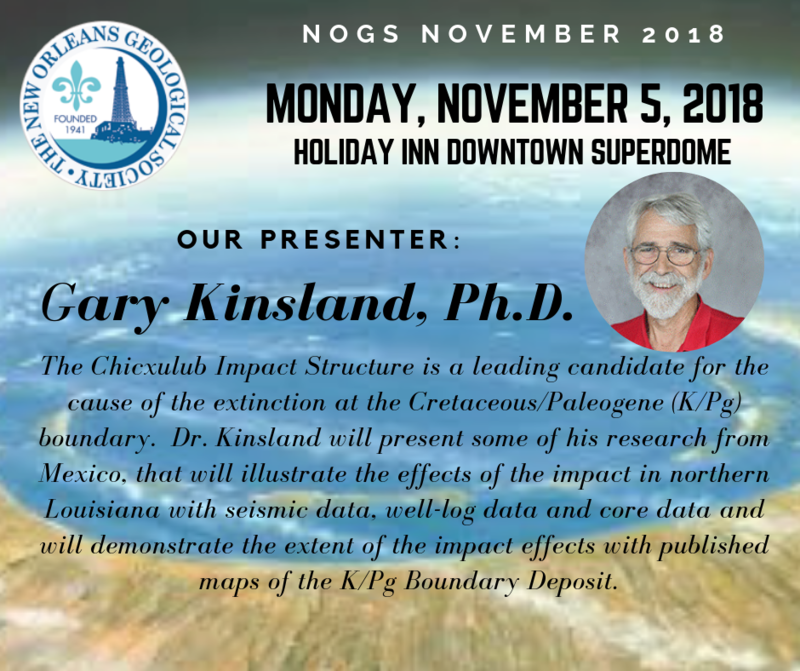 I will present some of my research in Mexico, that will illustrate the effects of the impact in northern Louisiana with seismic data, well-log data and core data and will demonstrate the extent of the impact effects with published maps of the K/Pg Boundary Deposit. Gary Kinsland, Ph.D. Gary was born in Eugene, Oregon 6/10/47 and grew up in southwestern Oregon. He graduated from Coquille High School in 1965. From 1965 until 1969 he attended the University of Rochester (U of R) in Rochester, N.Y. and received his B.S. in Physics. The next fall he entered the Geology program at the U of R and received an M.S. in 1971 and a Ph.D. in 1974 pursuing studies in high-pressure earth mantle mineral phases and strengths. After two years as a post-doc at U of R Gary took a visiting assistant professor job at Arizona State University for the 1976 -77 year where he learned and taught exploration geophysics. In the fall of 1977 he accepted a position at, then, USL in Lafayette, LA as a mineralogist/geophysicist. He has remained at the University of Louisiana at Lafayette, no longer teaches mineralogy, but has concentrated on geophysical research. For several years he led a research effort dedicated to the development of the coalbed natural gas resources of northern Louisiana. Since 1994 he has pursued research related to the Chicxulub Impact Structure on the Yucatan Peninsula of Mexico. He has collected and interpreted geophysical and topographic data over the feature and more recently has found geophysical and subsurface evidence of the effects of the impact in the subsurface of northern Louisiana. He is now a full professor holding the Pioneer Production Endowed Professorship in Geology and Petroleum Engineering.